Immerse yourself in the peaceful patterns of Gregorian chant with this classic-style windchime. Tuned to a medieval scale, it echoes the vocal music of the gothic era sung to accompany meditation in the churches of Europe since the late 8th century. The sound produced by the 8 precision-tuned tubes is soothing, uplifting, and incredibly rich. One of a series of 5 differently sized windchimes tuned to the same scale, the Gregorian Soprano Chime harmonizes beautifully with the other Gregorian Chimes. Imagine the sound of all 5 Gregorian Chimes hung outdoors and sounding together with their rich melodies. Woodstock Chimes are the original, musically-tuned, high-quality windchimes known worldwide for their superior sound. When listening to a Woodstock Chime, you hear a fine musical instrument played by the wind, perfectly hand-tuned using the ancient system of “just intonation” based on natural harmonics. This means the frequencies at which the different tubes vibrate are related to one another by simple whole-number ratios. Tones that are related in this way produce the most beautiful musical intervals. The sonic effect is exceptionally pure and soothing. More than 30 years ago, the first Woodstock Chime was created by founder and owner Garry Kvistad from an aluminum lawn chair he found in a landfill. As a professional musician and instrument designer, he was fascinated by the Scales of Olympos, a 7th century pentatonic scale that can’t be played on a modern piano. Garry had the idea to cut and tune the lawn chair tubes to the exact frequency of the ancient scale. 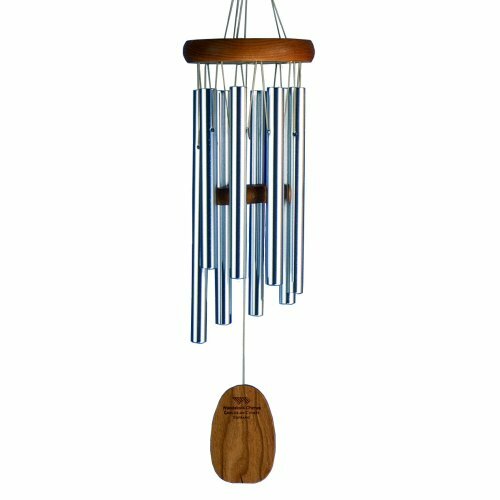 The resulting Chimes of Olympos was the first Woodstock Chime and is still one of our bestselling windchimes. Garry and his wife Diane founded Woodstock Percussion, Inc. in 1979 and it remains a family-owned business in New York’s Hudson Valley.